Twin Space Exploration Vehicles approach an asteroid with the Multi-Person Crew Vehicle docked to a habitat in the background. Good news for those who think they've got the right stuff: NASA opened the application process for its next astronaut class today (Nov. 15). The space agency will accept applications for the next class, which will be the 21st group of spaceflyers in its history, through Jan. 27, 2012, then begin a lengthy and highly competitive screening process. NASA expects to announce its final selections in March 2013, and the newly minted spaceflyers will report to Johnson Space Center in Houston for training that summer, agency officials said. While astronauts in the 21st class won't fly on NASA's now-retired shuttle fleet, there will be plenty of opportunities to get to the International Space Station — and perhaps destinations in deeper space, officials said. "Some of the astronauts we're recruiting today will be pioneers in our missions to make the first footprints on the surface of Mars," NASA chief Charlie Bolden said during a briefing today. NASA tends to recruit a new astronaut class every two to four years, to maintain a deep enough pool of spaceflyers, officials said. That pool has been getting more and more shallow recently. NASA counted 150 active spaceflyers in its ranks in 1999. Many astronauts have retired or left the agency for jobs elesewhere since then, and as a result that number has fallen to 61 in 2011, according to a recent report by the U.S. National Research Council. However, the station is slated to operate through at least 2020, and perhaps until 2028. So there will be a need for astronauts to perform research and live aboard the orbiting lab for a long time to come, officials said. While the shuttle's retirement left NASA completely dependent on Russian Soyuz vehicles to get its spaceflyers to the station and back, that could change by the middle of the decade. The agency is encouraging American private spaceflight firms to take over this taxi service, and it wants at least some of them to be up and running by 2015 or so. "As we enter this new era of commercial spaceflight, there will be even more opportunities for those of you who want to fly," Bolden said. 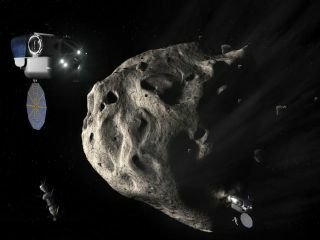 For its part, NASA is working to get astronauts to an asteroid by 2025, then on to Mars by the mid-2030s. It's developing a capsule called the Orion Multi-Purpose Crew Vehicle and a huge rocket called the Space Launch System to help get them there. So the options for future astronauts look to be numerous and varied, according to Bolden. "Human spaceflight is alive and well at NASA," Bolden said. "With the end of the shuttle program, we're now setting our sights on even more distant horizons. We're once again ready to go where no man or woman has gone before." Those interested in applying for NASA's next astronaut class can do so by visiting www.usajobs.gov. Minimum qualifications include a bachelor's degree in science, engineering or mathematics, as well as at least three years of relevant professional experience. A screenshot of NASA's job announcement for astronaut candidates on the federal USAJobs website. Don't expect to just sail through the application process. The space agency tends to pick literal or figurative high-flyers — people who have experience operating jet aircraft or who are highly accomplished in their respective fields. "It's very rigorous," said Janet Kavandi, director of flight crew operations at Johnson Space Center. Rigorous indeed. NASA reviewed more than 3,500 applications before picking nine astronauts for its 20th spaceflyer class in 2009. After selection, astronauts undergo training that lasts several years and is also extremely challenging, Kavandi added. Not everyone will make it through. "If you're selected and you make it through that process, the experience is well worth the wait, I think," Kavandi said. "Anyone who's been to space can say that it was definitely worth all the hard work to get there."